Thank you all so much for your contributions to the discussion on aging yesterday. First of all, I want to say that if anyone has had a nip or a tuck to make themselves feel better then I am more than supportive of you. We all have our ways to make ourselves feel better with how we look and feel. For me, I try to eat a healthy diet, I dress in ways that make me feel good, and I wear light makeup. What I do have a problem with is how the fixation our society has on youth is affecting what many women do to their bodies. When my daughter was working in Hollywood as a child I observed the way aging women were treated in the film industry. It was as if they were being told "shame on you for not staying young, for allowing your face to age, and your body to change." There were very few roles for these women. Beautiful talented women were being tossed aside and to compensate they mutilated their faces with bad face lifts. They became unrecognizable. They lost who they were. That fixation with youth has carried over into mainstream society and I hate how it affects the self esteem of women as they age. All women are beautiful and I do mean ALL women. Our faces tell our stories. Our smiles, our frowns, our wrinkles are all a part of who we are. There are many of us in this blogging world who are older, more seasoned women. It is up to us to change the way aging women are treated. We must band together to let younger women know that aging in itself is not a disease. It is not something to be ashamed of. If we learn to embrace the changes in our bodies then we will serve as role models for the women who come after us. AMEN! No truer words have been said! i sometimes don't recognize my aging self in the mirror (i see my older sisters or my mother instead of 'me') but aging is a privilege, and if i remain healthy, then that is what is important. 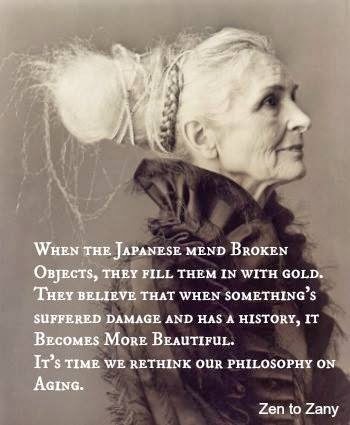 I love what you said that aging is not a disease. That's very true! However, I do think we should try to avoid "early aging" such as lifestyles that include sun bathing, smoking etc. À perfect balance in loving the age in the journey we are on. This was divinely beautiful and so is the lady pictured. We are seasoned and have a lot to say! Thanks Laura for starting this amazing conversation! Nice post, Laura. I just turned 68 and I don't feel that old on the inside and I refuse to sit down in the rocking chair just yet! I try to find something to smile about everyday and enjoy nature and the simple things in life. I think being content with what we have makes a huge difference in our aging process. It shows on our countenance and also helps our health by alleviating stress. We can always find something to worry about if we want to, but I try not to go down that road very often. I also try to keep myself looking as good as I can with what I have. I often see older women who let themselves go and I wonder why. Aging doesn't mean we have to give up looking our best even when the wrinkles and sagging skin are here to stay. I didn't see your post yesterday, but in my mind I'm no older than 30. My body says otherwise some days, but I think young. I don't try to be 30 or dress or act like a teenager but I don't dress or act like an old lady either (whatever old means:). I have some friends who do. They just are yet to discover who they really are. Sad. I love and appreciate my days more now. I think I'm a better person now than I was then. I'm not vain at all. I'm really insecure to some degree and find other women who are smaller or have prettier skin or look younger than I do, but I still consider myself a beautiful person on the inside and that makes me feel beautiful on the outside. The core of who I am is beautiful and that's what matters most. I think we can all learn from each other-young and old alike. I am 53 young and I love reading the blogs of young mothers and young women. I love the stories shared. We all have a story. We all have something to contribute. I agree wholeheartedly with your post. Thanks so much for the post. I think you are on to something Laura....and Blogher is saying that our blogs will become the next great "American" [Canadian] novel...the way we tell our life stories through them...let's change the face of history and make ageism a thing of the past. While there are always a great many physically beautiful young women, they may be beautiful on the outside. The same holds true for the older beauty. I am not militant about being treated as "elderly" but as I told the nurse at the office of my primary care physician. "Do not speak to me as if I am incapable of understanding a word over 3 letters, I could well be more intelligent than you will ever be. Age does not necessarily make me senile. " I heartily agree that age is not a disease. We must get this word out to the medical community as well. Age is an accomplishment.